Zhalavdi Geriyev in Itum‐Kali, Chechnya in September 2014. Image: Dominik Cagara. There are people who are much closer to Zhalavdi Geriyev — we only kept in touch sporadically — but most of them won’t be able to speak up. I will, no matter the consequences, because speaking up about the plight of journalists in the North Caucasus is the only thing left to do. 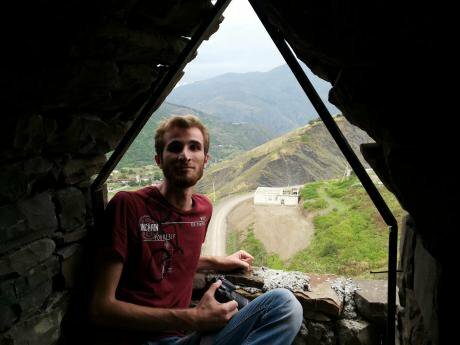 In September this year, Geriyev, 23, who worked as a journalist in the Russian republic of Chechnya, was sentenced to three years in a penal colony on the absurd charge of drug possession, an accusation which is commonly used to silence journalists in countries like Russia or Azerbaijan. Indeed, Memorial Human Rights Centre has recognised Geriyev as a political prisoner, being certain that he suffered as a result of his professional activity as a journalist. On 16 April 2016, three armed men dragged him out of a bus traveling to Grozny, hit him on the head and drove him, with his hands tied, to a forest for “questioning”. They repeatedly beat him and threatened they would kill him and bury in the forest. When another car arrived, a man pulled a plastic bag tightly over his head almost to the point of suffocation. He was forced to sign a confession in a cemetery in Kurchaloy, his native village. Zhalavdi invited me to stay at his apartment in Grozny, where he confided that he worked undercover for Caucasian Knot, an online news outlet operating in the North Caucasus. He never published under his real name; he signed his reports with a generic nom de guerre, a common Chechen name and surname. I know he went to rallies, conducted vox pops, and followed court cases. He never criticised Chechnya’s president Ramzan Kadyrov explicitly, even in private conversation. That didn’t help much. Zhalavdi is currently serving his sentence in Chernokozovo, a notorious penal colony located in the north of Chechnya, which earned its infamy during the second Chechen war. Back then, the prison served as a part of the filtration camp system, and it was known for torture and summary executions. Today, the conditions in the colony are still so bad that three years ago the prisoners organised a rebellion and a hunger strike. Zhalavdi’s friend told me that at home everybody is happy — at least he’s alive. In the North Caucasus, everybody still remembers the case of Timur Kuashev, a Circassian journalist who cooperated with the Chechen journal Dosh (“Word”). In August 2014, Kuashev was found dead in a suburb of Nalchik, in Kabardino–Balkaria. He had been under surveillance, which was switched off exactly around the time of his death. Investigators concluded that he died as a result of acute coronary insufficiency, despite widely voiced claims that he could have been poisoned. The perpetrators were never identified. The worst feeling about these cases is powerlessness. An online petition demanding an impartial trial for Zhalavdi was launched (it now has almost 24,000 signatures), but I can’t imagine that a state which doesn’t hesitate to murder its own citizens would care. Zhalavdi’s trial was needed for the Russian authorities to show that genuine civic activism and journalism won’t be tolerated. These activities hit right at the heart of the system, which stands strong with injustice, repression and control. I write Russian, because nothing in the Chechen Republic, or any other place in Russia, happens without the approval of the federal authorities. Chechnya serves as an example for the rest of the country. Ramzan Kadyrov has never “gone rogue”, which was often claimed by experts at the time of Boris Nemtsov’s murder in February 2015. Kadyrov is a direct product of Russia’s policy of intimidation against the brightest in society, who would be able to bring about genuine grassroots-led challenge to the system. That’s something Russian society needs now more than ever. This policy results in a situation where Chechen journalists are too terrified to report anything that doesn’t put the authorities in a good light. They fear not only for their own lives, but possible reprisals against their relatives — a common weapon which is now used to further intimidate the population and prevent people from speaking up against the regime. There is only so much a person can take. With no systemic solution to address people’s grievances in the North Caucasus, people are going to increasingly channel their activism into radical ideologies, often with religious inspirations. In this year alone, almost 200 people fell victim to the armed conflict in the North Caucasus between the authorities and Islamic rebels. The insurgency is fuelled by Russia’s hard-line policy in the region and the conflict has no end in sight. Tellingly, Zhalavdi was accused by his kidnappers of being a member of Islamic State, showing how, for the authorities at least, there’s little between a journalist and a terrorist. While strolling through the hollow streets of Grozny in autumn 2014, Zhalavdi told me that, when he was a child, he didn’t know that there were places in the world where there was no war. The wars from his childhood continue, despite all the PR stunts trying to depict Grozny as a phoenix rising from the ashes, the forefront of a new brand of peacebuilding — the same kind Russia is deploying in Aleppo today.